celebrate your marriage and enjoy our wines. 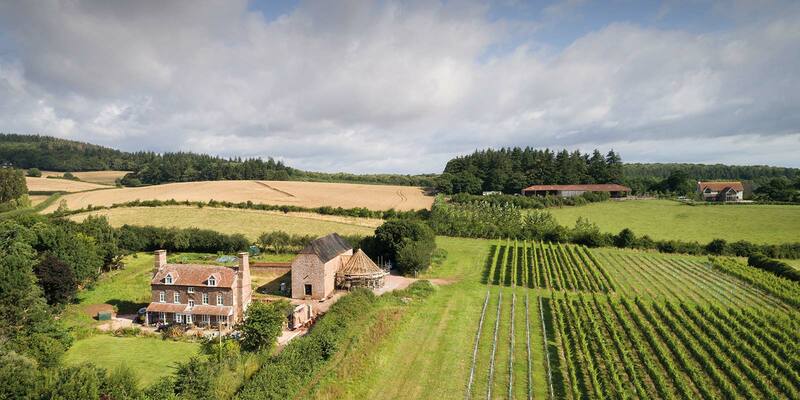 Opened in May 2018, Brickhouse Vineyard is a stunning Devon wedding venue overlooking the vineyard. 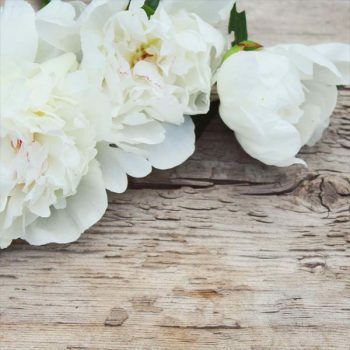 Tucked away in the rolling Devon hills, set amongst 20 acres of fields, woodland and organic gardens, it is perfect for romantic elopements, intimate and small weddings. The newly renovated 18 Century Round House, set in an idyllic, secluded corner of south Devon is conveniently located just 20 minutes from Exeter. It offers exclusive venue hire and total privacy, perfect for corporate events, client entertainment and private functions. Join us for a unique wine tasting and wine and cheese pairing experience. 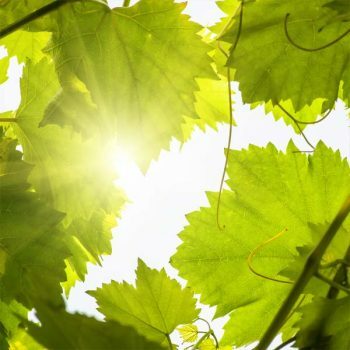 Learn about the English grape growing in a guided tour of the vineyard, and enjoy amazing views of Devon countryside while tasting our award winning wines. We’re delighted to welcome you to Brickhouse Vineyard. We hope you will agree, it’s a rather special place. 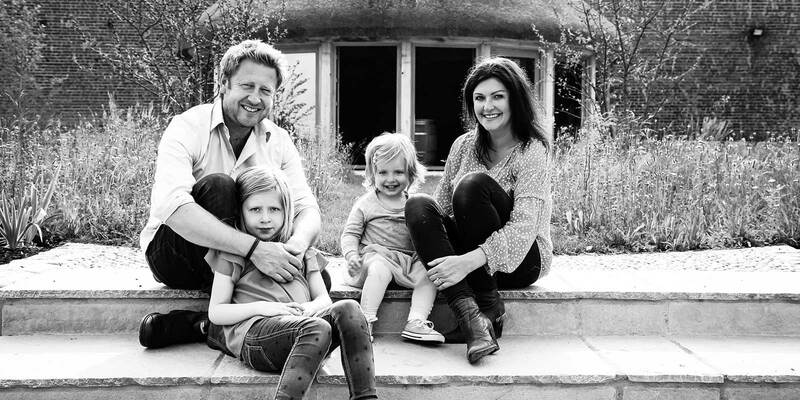 Brickhouse Vineyard is home to Joanna, Matt and their two young daughters, Emilia and Ellie. Following our hearts, in 2015, we left London to pursue our dream: to create something new and unusual in a perfect rural setting for those looking for a Devon venue for special events, and at the same time produce some amazing wine. A driving motivation for us was to create a rural family business that would not only provide a better environment for our growing family, but also provide a better work-life balance. A few years on, we’re excited to be able to share Brickhouse Vineyard with you for intimate weddings, all types of events and wine tasting. 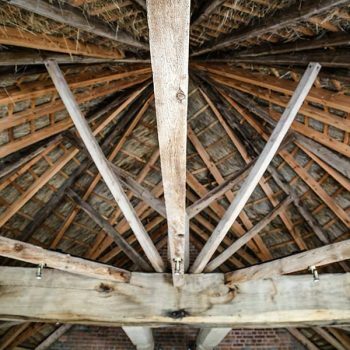 In 2015 we could see the potential in the Grade II* listed house, one of the very first houses in Devon to be built from handmade bricks, the threshing barn with the attached Round House, or horse gin, and the vineyard. After nearly three years, the Round House renovation is complete and the vines are producing around 1000 bottles of wine a year. We’re welcoming guests and have no doubt that you’ll enjoy the space we have created, and maybe sample some of our delicious wines too whilst overlooking the slopes on which they are grown. You’ll find us just 20 minutes from Exeter, hidden in the hills of south Devon, providing a special space, in stunning surroundings for gatherings you’re planning. 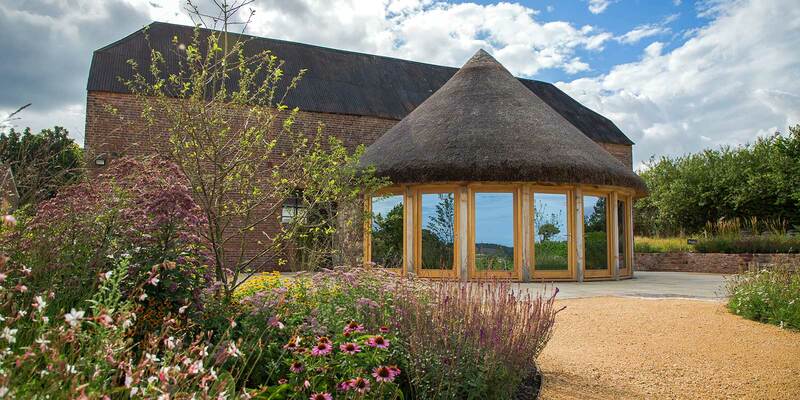 The thatched, 18th Century Round House with massive oak beams and an octagonal softwood roof structure has been completely rebuilt, providing a flexible events space, just for 2, to up to 50 people seated or 60 non-seated. Sitting on the landscaped terrace, overlooking the vines, and the rolling Devon hills makes it an idyllic spot for weddings and an inspiring space for events and wine tastings. What’s more, we work with handpicked local services to ensure you have all you require for you event, and we’ll be on hand from initial enquiry to the day of your event to ensure everything runs smoothly. "We had our winter wedding at Brickhouse Vineyard and we couldn't have asked for a more perfect day! Devon countryside was breathtaking… and the Roundhouse was intimate and romantic…Thank you Brickhouse Vineyard for making our special day truly amazing!" "We had absolutely fabulous wedding day at Brickhouse Vineyard on a gorgeous autumnal afternoon. Thank you Joanna and Matt for letting us share your venue to make our special day truly magical. The surroundings were perfect and you were truly amazing hosts. We couldn’t have asked for anything more." "Stunning location, beautifully and lovingly restored, fabulous family running it, been to some great events there. And then they have their own amazing wine!" "Beautiful venue, fantastic wine and Jo was just lovely and really knowledgeable. We had a wonderful evening and looking forward to a return visit as soon as we can." "A simply stunning unique location, from the moment you turn into the drive you know its special. Jo and Matt have been a pleasure to deal with, very approachable and willing to go the extra mile." "Brickyard Vineyard has been built with real love and attention and the hosts, Matt and Jo are just amazing. You will feel incredibly welcome and the location is just stunning. Such a magical place - highly recommended!" "Stunning newly launched venue for private and corporate events. Take in the tranquillity of this beautiful place and whilst there, you must try their delicious wine!" "Thanks so much for your fabulous Rose. Gorgeous with the goats cheese as you said! The Sauvignon Blanc is delicious! Perfect for pre-dinner tipple and great with Yarg too. Whoever knew roses and whites went so well with cheeses. Lovely!" "Just wanted to say thank you again for allowing us to sample your truly delicious wine, a lovely lunch and your very kind hospitality. Brickhouse is going to be a fabulous venue!"